Light, non-greasy skin care solutions to oily and different skin combinations! Enriched with the real essence of fruits, aloevera and gold, Cosmo Herbal’s skin cream imparts a glowing, and porcelain look. For best results, use it twice daily. Skin nourishment like never before! 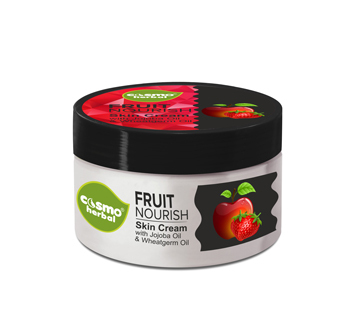 Introducing CosmoHerbal’s Fruits Nourish Skin Cream that comes enriched with real fruit extracts and a whole lot of natural oils (Jojoba Oil & Wheatgerm oil) for an all-day moisturization. Ideal for skins of all types, the nourishing cream is known for its supple and smooth effect it leaves on your face. Besides, its triple moisturising mechanism is highly effective in improving skin elasticity and offering a healthy look. If you are in for only creams, then also we have a solution for your drying skin. Highly enriched with Avocado oil, this suitable to skins of all types Aloevera cream penetrates deep in to the pores and maintains the natural oil balance of the skin. Aloevera since ages is the prime remedy for skin nourishment. It is rich in nutrients majorly required for maintaining a good skin health. Besides, Aloevera also reduces stretch marks and visible signs of ageing if applied as a skin cream. 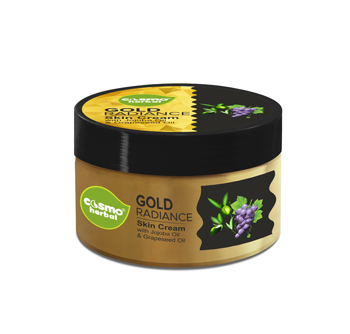 Cosmo Herbal’s Gold Radiance Skin Cream works just fine in magnifying the skin’s inner beauty. Its regular usage diminishes the appearance of dry lines and restores the natural balance. Besides, it also acts as a protective barrier from harmful UV rays, wind and pollution.